Clean,cute, and very comfortable. We really enjoyed it. This location is really top notch. As stated the door is literally in the mall so you are walking distance to all sorts of dining options and shopping. Having the balcony was fantastic. I would highly recommend this property assuming you want to be in a downtown location. While the cleaners were taking care of the other rooms I had the opportunity to peek in all of them and they were all very beautiful. I will be back. The staff at Stay Charlottesville (Hillary and Sarah) are great, they were responsive and made sure we had everything we needed. I can't recommend this apartment more, it was clean, well decorated and of course the locations is incredible. My husband and I rented all three Old Met properties for ourselves and our family for our wedding at Old Met and would couldn't have asked for anything better. Not to mention the stat at Stay Charlottesville are incredibly responsive and want to make sure you have taken care of. One of the best wedding vendors I worked with! Excellent home for vacation with my wife and three toddlers. The townhouse was spacious, very clean and had everything we needed. Especially enjoyed the quiet neighborhood (with the exception of the construction of new builds around the corner) and proximity to downtown which was only an $8 Uber ride. We will definitely stay here again when I come back to visit my family in Keswick. Check-in and check-out were really easy and overall the experience was fantastic. The team was awesome. They kept me informed and responded promptly to questions. This property was great in location. It was within walking distance to the restaurants. In addition, it was immaculate and comfortable. The kitchen was well stocked with dinnerware and cookware. The only issue was the coffeemaker, which was not cleaned properly. What I liked most was the privacy that it offered. The noise level was next to none. The binder with the list of local restaurants was also helpful. I had an issue accessing the place and they called me back to resolve the problem almost immediately. This unit is incredibly well designed, and beautiful, with all the practical amenities one would need for a short stay or a long one. I called a couple of times to ask about bringing our dog and billing information. Both times the individual answering my questions was kind and helpful. The property is in a quiet neighborhood with a few restaurants and a small convenient store. We ate at The Local in Belmont and it was awesome. For other activities, it is about a ten minute walk to the downtown mall which has tons of shopping and restaurants. We walked to the farmer's market on Saturday morning which was also about a ten minute walk. The property is a bit small for how expensive the weekend rates are. However, it has everything you need to enjoy your weekend. The apple tv was a nice touch! Stay Charlottesville team was great. Loved the view. Loved the feel. This property is amazing and we can't wait to come back. Incredibly clean, very well appointed, scenic view is amazing. It is a small hike from town which was fine with me. When we got there, I didn't want to leave. 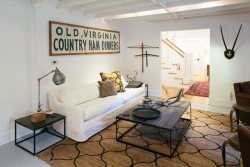 I could not make the property any better and the Stay Charlottesville system went very smoothly. The area is nothing but rolling hills, farms and well-kept fences, some gorgeous houses, a great deal of natural beauty. The owners of the house in front left us to ourselves but were charming when we met briefly. It was bigger than we expected, beautifully appointed and private. The people at Stay Charlottesville were very friendly and very helpful. The house was really perfect for what we were looking for in a vacation rental. It was in a great location, it had parking and was very comfortable. Our only recommendations would be a list of the TV stations and info about trash removal. There was not a recycling bin either and that is important to us as we have been recycling forever. Also the temperature in the oven was off and so it took longer than usual to cook our food and the closet door in the bedroom would not stay open and so every time you would be in there it would slide close. It got to be annoying, but in the whole realm of things it wasn't a big deal.